Today I am like a balloon floating freely up into the sky, feeling hopeful, knowing the future holds so much possibility and it's all because of Donalyn Miller's book, Reading in the Wild. It's finally here! I am elated because this book holds so many necessary ideas. I say necessary because we need to read Reading in the Wild. 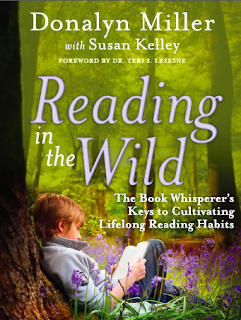 Whether you are a teacher who, like me, loved Donalyn's The Book Whisperer and it changed your life personally and/or professionally, or someone who is new to Donalyn's work, you need this book. Reading in the Wild affirms or gives light to how we can support students to develop authentic habits of lifelong readers. Every teacher should be thinking about how to foster the love of reading in a way that honors our students as individuals and encourages them to be readers independent of us. I imagine that everyone who reads this book might underline and circle (or maybe highlight if you are so inclined...) and write "YES!!!!!!" in the margins as I did. Donalyn articulates so many things that I needed to hear about reading and best practice and it's all supported by research. 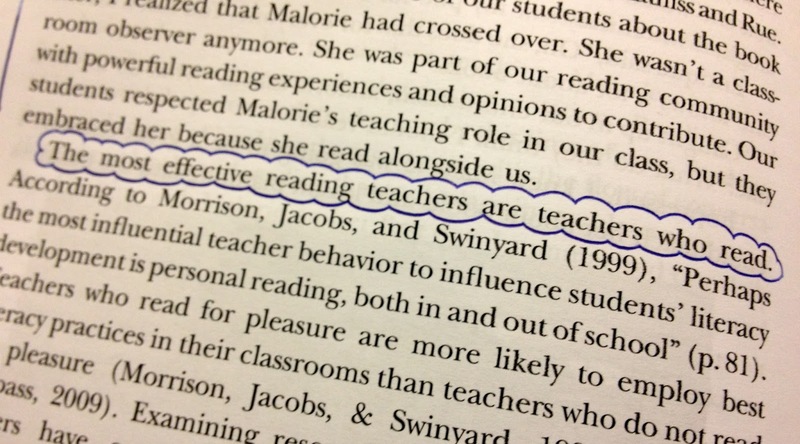 She boldly says what needs to be said about teaching readers and it's awesome. Along the way, I thought of countless people that I wanted to share this book with and I hope you read it and share it with others as well. This was my favorite quote from Reading in the Wild because if we want to encourage students to be readers, we have to be readers ourselves. It all starts with a teacher who lives the life of a reader and models that for students. Donalyn also talks about honoring readers who might do more digital reading than reading of novels, they are readers, too. I find that I continue to encounter people who don't think of themselves as readers because they don't fancy fiction or don't carry novels around with them. In honor of the release of Reading in the Wild, I thought it would be fun to release some books into the wild using Book Crossing. If you've never heard of Book Crossing, I think it's such a fun idea. I discovered Book Crossing a few years ago when I checked The Sideways Stories from Wayside School out from my public library. I noticed that it had a little sticker inside and it led me to the Book Crossing website. Basically, at Book Crossing you can get a little Book ID number that you stick into your book and then people can log in and share where the book is at is travels around and finds other readers. Here's what Book Crossing says about releasing a book into the wild! "Referred to as the "wild release" (and loved by so many BookCrossers), this type of sharing is a bit like nudging a baby bird out of the nest or sending your kid off to college. Your book doesn’t want to spend its life on your shelf gathering dust; it wants to get out there and touch lives! So leave your labeled book on a park bench on a summer day, in a train station, on the table in your favorite coffee shop -- anywhere it’s likely to be caught by another delighted reader. Then come back and read about your book’s new adventures!" "I habitually scope out what other airline passengers are reading. Recently, on a trip to Chicago, I noticed a woman reading The Night Circus by Erin Morgenstern. I read the book last year and listened to the audio, which was amazing. The woman was sitting two rows up on the opposite side of the plane and I was frustrated that I couldn't catch her eye and start a conversation about it. Last winter, I got off the plane in Dallas and ran into one of my former students, Lyndsey, who was waiting for the same plane because her grandmother was on it. Lyndsey ran up to me and we began talking about books. She sighed and told me she hadn't read anything good lately. I opened my carry-on and gave her my copies of See You at Harry's by Jo Knowles and The False Prince by Jennifer Nielsen. Lyndsey's dad just shook his head and smiled, "I don't know when we can get those back to you, Mrs. Miller." I told him that it didn't matter. I talk about books with my hairstylist, Misty, with my fifteen year old daughter's friends (who walk out of our house laden with books), with strangers at Barnes and Noble, with my students and their parents. On another trip, I was eating alone in a restaurant and began talking with my server about books. She began writing down titles on her order pad and giving me book suggestions. A few minutes into my salad, she brought another server over to my table to get a book recommendation. Throughout the meal, I met many members of the restaurant wait staff who wanted to share and talk about books." I'm so excited to be able to celebrate Reading in the Wild and love knowing that so many others will be reading it and reflecting on how we support readers in and out of school. Already this year, I have shared how important it is to be true to yourself - even if that means being a little wild - as we celebrated Mr. Tiger Goes Wild and then Katy Perry's song, Roar inspired me to think about standing up for what you believe in which makes Donalyn's book, Reading in the Wild, is so timely! It's time that we make positively sure that we are true to ourselves as lifelong readers as we support students in being lifelong readers. Thank you to Donalyn for inviting me to be part of this special blog tour!